This 6 piece measuring spoon set is made of durable and attractive 18/8 stainless steel. This superior material and the high quality construction ensures long lasting performance for many years to come. 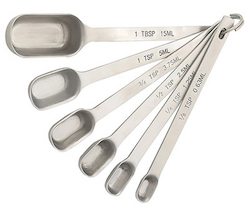 Set comes with six measuring spoons: 1/8 teaspoon, 1/4 teaspoon, 1/2 teaspoon, 1 teaspoon and 1 tablespoon measurements.